A first important victory has been won towards a change of course in European fisheries policy. The expertise and the conviction of Swedish Green MEP Isabella Lövin played a key role in this promising move. 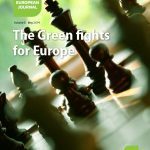 Green European Journal: What was your professional and political background before being elected to the European Parliament (EP)? And how do you explain your interest in the issue of fisheries? Isabella Lövin: I was working as a journalist in Sweden for more than 20 years, mostly writing about cultural and environmental issues. At the time I was writing for All About Food, basically Sweden’s biggest food magazine, with a lot of devoted readers who are interested in food, where there was the first discussion in the Swedish media about overfishing. I started doing some research around the situation in the Baltic Sea. The first question was: is it ok to eat fish from the Baltic Sea, the Baltic Cod? Is it overfished? Is it ok to have recipes with cod or not? And what I discovered was that all the scientists were agreeing that cod in the Swedish sea was endangered. I also discovered that in Canada in 1992 the world’s largest cod stock collapsed and was completely eradicated from the Grand Banks of Newfoundland and has never recovered. There’s no more cod fishing in Canada where they used to have the world’s largest cod fishery. Ten years later, the same thing was going on in the Baltic Sea and in the North Sea. Was this a real surprise for you? For me it was completely unbelievable that no one was doing anything about it. We had the knowledge, and the really frightening example from Canada, and still all the politicians in the EU were just trying to get as much of the quota for their own fishermen as possible each year and consumers were not even aware of the problem. So I was so shocked by the whole thing, because it’s not only a problem about having only access to our own fish, it’s also affecting water quality, it’s promoting algal blooming, it’s also making us dependent on imported fish instead of being self reliant for fish. And we’re subsidising EU fleets going to West Africa and the Indian and Pacific Oceans to provide fish for Europeans. So it’s wrong on all counts. It’s wrong on the environmental point of view, in terms of justice between the rich countries and poor countries, and also it’s morally insane that we’re driving certain species to the brink of extinction, using taxpayers’ money to subsidise the fleet. So you decided to write your book then? I decided to write a book about it because it was too complex and too huge a problem for a single newspaper article. We decided by the way, in the magazine, not to print any more fish recipes for fish that were endangered. My book Silent Seas was published in 2007 and translated into English and Japanese. It was a bestseller in Sweden. I received all sorts of awards and prizes for the book which was greatly debated in the media. And then the Greens asked me if I wanted to join them and to be a candidate for the EP elections, in order to be in Brussels, be in the Parliament, and try to reform fishing policy. And so in 2009, you jumped into the European arena. Yes, it was quite a shock! But you knew from the start that it would be a tough game? Or have you been surprised? I wasn’t expecting to be able to implement much change. But I was determined to do whatever I could, even if I could just change policy a little bit in a positive direction. So this has been my only aim and goal in the EP. I told the Swedish Greens not to expect that I will work on all the issues around immigration, gender equality, climate change or whatever. I had the same image that others had of the EU system, that it’s so huge, and so impossible to influence anything. I was almost prepared to leave the EP, if I understood that I could not influence anything, and that I would do a better job as a journalist in shaping public opinion. And did this image change? I felt quite soon that I could really change the views of my colleagues in the fisheries committee by explaining some certain things to them, and if possible, get a majority. And quite soon we stopped a fishing agreement with Guinea because there was a military coup there and a massacre of civilians. The people acknowledged that it wasn’t a good agreement and it was cancelled. It was the first time ever that the EP had said no to a fisheries agreement. So it took quite a long time to reach last year’s success, with this agreement on the reform of fisheries. But you were not alone on the committee. You had allies in other parties. That’s the key. If you belong to a small group, the Green Group, you can’t do anything if you don’t find allies. So that has been the real work: to find allies in the other groups and convince them. We formed a cross-party action group called Fish for the Future, where we had very active members from all the political groups and who cooperated in order to make people aware in the whole Parliament, not only in the fisheries committee. Because normally the people in the committees vote in the way that their groups recommend. But because the members in the fisheries committee were very closely linked to the fisheries industry, we wanted all the MEPs who belonged to the environment committee, and beyond that, all the MEPs in the EP, to be aware of the problem, that we had the possibility to change things during this mandate. We arranged lots of seminars and debates to spread information to all the members, not only to the members of the fisheries committee. That was also a key to success. It seems that one of the major changes is that you succeeded for the first time in not having industry running the committee. Can you explain that? Yes, of course it’s important to know that the Lisbon treaty changed the dynamics on fisheries policy. Before 2009, the EP was only giving recommendations. No we have full co-decision powers. The industry was not really prepared for this change. They were much more used to cooperating with governments from the different Member States. They had their connections and their good old lobbying tactics in the capitals of Europe. But your lobbying was more efficient obviously? Our lobbying was more internal, in the European Parliament. And we got a very strong majority in the Parliament in the end. We had about 502 against 139 in the final vote in plenary to ban overfishing and to phase out the practice of discarding (throw edible fish overboard). We also had many good suggestions on creating networks of marine protected areas and also putting a lot more strict conditions on the EU fleets fishing outside of European waters, especially in developing countries. I was surprised that there was no negative reaction from the sector. The reception was rather positive, no? I think most of them realised that if we continued the same way, by the next time there would be a possibility for reform only eight out of more than a hundred commercially exploited fish stocks would be within safe biological levels. So if you look at all the numbers, catches have gone down in Europe in the last 10 years by 40%. We are importing 70% of all fish, employment in the industry has gone down, the size of the fishing economy has decreased. No one is really earning anything out of this situation where we are taking too much fish out of the water. Most of the industry realised that fact except for a small part, which is the large multinational fleet that don’t really care about European waters because they go fishing somewhere else if it’s overfished here. They could even go to the other side of the planet, and they do. So you succeeded in starting real European regulation and cooperative management of fisheries in Europe. The next fight for the Greens will be on a global level I guess. You are right. Fishery is a very global activity. So it’s really important that the EU fights for sustainable fisheries globally, and we can, because we’re really active all over the planet and in all the global organisations. But this was such an important, crucial step to make, to say ‘We forbid overfishing in Europe’. Because if we had continued, we wouldn’t have had any credibility at all if we were to go to the Pacific Ocean and tell people over there, you overfish. Until now it was impossible for the EU to be a promoter of sustainability anywhere else. We Greens managed to make access to fisheries much more transparent. The new regulation has also a very important part on transparency. Indeed, this was a really important step. We, Greens, managed to make access to fisheries much more transparent. So each Member State can choose who, out of their fishermen, they want to give the right to fish. Do they want to give it to the big industrial trawlers? Or do they want to give it to the small-scale coastal fishermen? It’s the same fish, but in one case you have maybe 10 people that work on the boat and they get the same amount of fish as a hundred smaller boats that are fishing with nets and it’s much less damaging for the environment. So you can choose to give the fish to smaller boats instead of the bigger boats. That’s a concept that the Greens pushed very hard in this reform, and that’s actually in the legislation now, that Member States have to be very transparent on how they allocate the fishing resource. Of course, this is decided on a Member State level, but they have to provide the objective criteria for allocating fish. Will the way the subsidies are given be more transparent? This is one of the points where we’re disappointed in the reform. We are not happy with this part on the fisheries fund. There is still money going to the wrong things. Transparency has not improved. One of my missions was to disseminate so much information that people understand a little bit about this problem. Looking now to the future, what are the priorities? When will we see if this reform has an effect on the stocks of fish? Well we should already have the first results next year when all the quotas should be set at sustainable levels. And in the Baltic Sea there will be no more discarding of fish starting in 2015/16. But it is difficult to predict when stocks will recover. I would say that maybe within ten years we will see substantial differences. In the United States they had their new fisheries legislation in place from 2005 and they can see substantial improvements now. But in some cases it will be very difficult to see recovery because the stocks are so depleted. On the west coast of Sweden for instance, there are some stocks that are probably already eradicated and that will never come back. If you look at the example of Canada, they have had a complete cod fishing moratorium there since 1992 and stocks have never recovered, and they’re never coming back. What needs to be done in the next legislature? First of all, I think number one is to see that this policy is really being implemented. So while we can’t control that Member States do what they’re supposed to do, it’s important that now that we have all of the good principles on paper we also need to see them done in practice. Secondly, I look very much at the global arena, the UN is going to negotiate a new agreement to protect biodiversity in international waters. That will be very important. Also the issue of the Arctic and the fishing possibilities that are opening up as the ice is melting. We’ve already had a resolution in the Parliament that we want to see a protected area where the icecap used to be. There are also lots of environmental things that impact the oceans, like plastics, there are lots of micro-plastics in the ocean. The EU is going to propose a new directive on plastic garbage and that could be very interesting to work on. And not least the issue of climate change because that is also very negative for our oceans. So it’s crucial that the Greens continue to be strong because the other parties are less vigilant on these issues. Absolutely. One of the most important things for the EU during the next mandate, I think, is environmental issues. The economic issues are also important but mostly they can be dealt with on a Member State level. But on all the issues without any borders, such as the atmosphere and the ocean, we need the EU to be very strong. And the Greens are the most active and the ones prioritising these issues. So I think it’s extremely important that we get a strong Green group that can influence and lead the Parliament on these issues. We have the competence and the drive and the passion to do it. I think the citizens of Europe want the EU to deal with these global, important issues that are so decisive for our future and our children’s future.